You know how kids simply love to be naked? My kids love screaming around the house in their birthday suits. Naked is such wonderful word – uncovered, undressed, bare…..
Alas, it is also the name of a brand of juice smoothie owned by PepsiCo. I am sure the executives at PepsiCo like to walk around naked too. Of course, paying 9 million dollars because they mislabeled their Naked juice with “all natural” might have made them want to put on some clothes (USA Today). I don’t buy smoothies typically because I bought myself a super duper high power blender that I use to make my own. My green smoothie that doesn't taste like grass and my strawberry cheesecake smoothie are two of my favorites. It should say “No Cane Sugar Added But Don’t Worry Folks There is 55 Grams of Sugar In This Bottle For Your Enjoyment”. In comparison, same size container of Coca Cola has 41 grams of sugar. Fifty-Five grams is equivalent to 11 teaspoons of sugar. Imagine spooning 11 teaspoons of sugar into your mouth. That can't be good! This is a SUGAR and Protein Smoothie. When they use fruit juice and puree, they add concentrated fruit sugar without the benefit of the fruit’s fiber. Are Naked Juices healthy? I would only say they are if you believe spooning sugar in your mouth is a healthy choice. Please, please drink this only as a treat. Honestly, I’d rather have a milkshake for an indulgence. 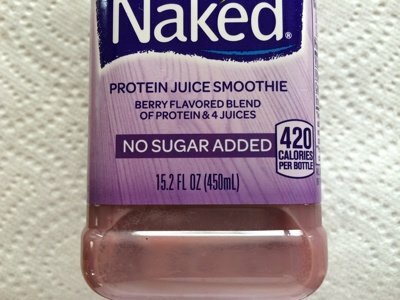 What do you think of Naked Smoothies? I don't drink this type of beverage, and I think the claim on the label is terribly deceptive. Thank you for your enlightening posts, Snack Girl! This is exactly what I love to find out from you, Lisa. This is a great example of how a label can be "true" and misleading at the very same time. If it seems too good to be true, it probably is. Thank you for tracking this down. I agree with you - WAY too much sugar. I have personally found that I can control my hunger and appetite by staying away from high sugar foods. If something has over 20 grams in a serving I consider it loaded. 55 is very high and definitely something you would only want as a treat on rare occasions. That is not the only reason NOT to drink naked drinks. Look deeper into the ingredients and you will find serious issues with some of the things they use. I will never purchase these juices again. I'd much rather have a vodka and diet lemon/lime for about 100 calories any day. I have never understood the smoothie craze. To me, to drink the amount of calories in any type of smoothie makes no sense. It is gone in no time, and passes right through you. I would much rather eat the fruit and yogurt, or even ice cream for a much more enjoyable treat that lasts longer. But I digress....LOL! That said, I am constantly amazed at the deceptive marketing of these so-called "healthy" products. Which is why I stay away from most processed foods. I'm also trying to teach my 16 year old how to look at labels to detect sugar, artificial ingredients, etc. If we think we can be gullible--consider how easy it is for kids to fall for this marketing! I have a digestive condition and cannot eat or drink anything high in fat. I know I need more protein because I eat minimal meat. What protein smoothies do you suggest? Or what low- to no-fat sources of protein do you suggest? What are your thoughts on Odwalla and Bolthouse Farms? I've tried Kefirs, but the fat content is high and makes me sick. Krista - use 0% fat plain Kefir. Add 2 T of Polander's Sugar Free + Fiber preserves, protein powder (Design from Trader Joes) and frozen no sugar added strawberries! GREAT homemade smoothie protein drink. Snack Girl - please explain the difference between NOT from concentrate and juice from concentrate. Not sure I understand which is healthier. Thanks for always having our backs with the research and information you provide about products like this. I've tried Naked smoothies and they never did it for me. I never felt satisfied from them anyway. Now I have even more ammo as to why I should stay away from them. Any fruit drinks like smoothies or stuff like this has way too much sugar in it. I always look at the sugar content. I would rather eat a whole fruit then drink of fruit. And if I decide to have a smoothie I make it from scratch so I know what's in it. A lot of people when trying to lose weight really do want more protein and I understand that. Read the labels though because you don't need all that added sugar. This is very high in protein and natural sugars from fruit. Are you saying there is not normally sugar in fruit? What you are showing is a 15.2 ounce bottle which is 2 servings. 29 grams of sugar, 16 grams of protein, 450 mg of potassium on the label per each 8 ounce serving ans 220 calories per 8 oz. serving. There is also 100% of Vit. C, 8% iron and 4% calcium per 8 ounces. In a 15.2 ounce bottle of APPLE JUICE there are 50 + grams of sugar. One KIND bar has nearly as many calories 210 calories per 40 gram bar, no vit. C, 6% iron, 14 grams of carbs, and half the potassium. Only 5 grams of sugar though, a plus for them. I am even more concerned about the phytates in soy nd nut products in these products. I am not sure there are soy products in KIND bars because I can't seem to find a full list on their site. The phytates bind vitamins and minerals to them so how much nutrition are you receiving from either one? Maybe not as much as you think. The sugar in soft drinks is often refined sugar not sugar from fruit that is assimilated more slowly and thus not raising the blood sugar so quickly and dramatically. As is often the case I have observed that only half truths are posted and not just by the offending companies. I have had the same question in my mind I_Fortuna concerning the KIND bars. I wonder why it's so hard to find information on their site??? Seems very suspect to me! I'll grad a handful of nuts instead and mix em with whatever I see fit and out them in snack bags. I don't trust these companies! But...they didn't add any sugar. It's all from fruit. So yes, it's very high in sugar, but I don't think their labeling is deceptive. Thanks Lisa, this was a great post. So many people don't make the connection between fructose and "sugar". As a nurse, I learned years ago that OJ and other juices were as bad for diabetics as cola and other sugar-sweetened drinks. If we reserve drinks like Naked and other fruit drinks as treats and ate whole fruit, we'd be better off. I think the whole smoothie craze is problematic for people who don't bother to do a little research on the nutritional value of food. I'd rather eat my fruits and veggies than drink them. Give me whole foods any day! gotta agree with Kailey...the sugar is all from fruit. I do agree that no fiber at all is not good, but what happens when people make smoothies at home, with their juicers> Does anyone know how much fiber nakes it through there? I'd really like to know. When the Naked drinks are on sale for 2.50 ea. I will get the Green Machine. I only drink half and sometimes during the day it is so good I finish it off. I usually do not worry about the sugars from fruits and veggies, but all is in moderation and variety,I seem at 60yrs old to maintain a good weight. The Green Machine has wheatgrass and spirulina, which I do not keep at home. I hate that it is not organic. I have been drinking for awhile now and I will have to check out the label again. I want just whole fruits mixed and I do not remember soy being but any soy you eat should be only organic. You know that Starbucks uses organic soy milk, I was excited to hear. Anyway happy drinking.